Our good friend and Amelia’s FAVORITE yoga instructor came over for another Food With Friends cooking video. Olesya is from Russia and speaks several languages, so you get to hear some cool pronunciations. Olesya had never tried tofu, so we invited her over in our first Food With Friends video back in Episode 35 to cook Tofu Scramble. 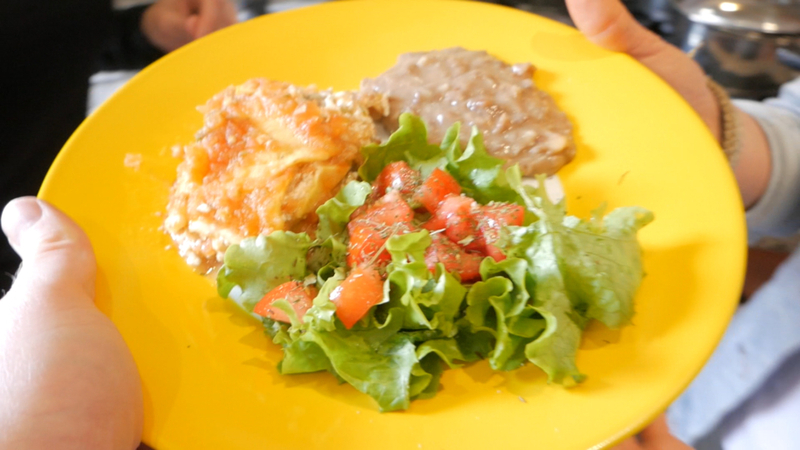 And in this video, she learned how to make our easy and satisfying Vegan Mexican Lasagna. YUMMM!!! Amelia also walked her through our Vegan Refried Beans recipe, but you can use store-bought to save time (just make sure they’re oil and lard free). And since Olesya never arrives empty handed, you’ll also learn how to make rich and delicious Plátanos con Pasta de Maní (You can find the recipe here: Ecuadorian Peanut Butter Plantain Recipe). We always have SOOO much fun when our friends come over to cook with us! >> O: Are you read to film? >> O: [laughing] Yeah, I am. >> JP: Not friends FOR food. >> O: More tofu, right? >> A: Yes. More tofu. >> O: You look nice! >> A: Thank you! I like your earrings! one of the Rumisol [inaudible] actually. >> JP: I like your necklace. >> O: What else you like? which is another tofu dish. And I already made refried beans. You’re gonna really like this. This comes together so quick. and lime juice in here. I did it last time. >> A: Yes. He’s all about his efficiency. and we’ll be good to go. >> A: About a half hour. >> JP: Yeah, it’s super fast. >> JP: Yeah, those are just corn chips. >> JP: Corn and water. >> A: Which are just corn. >> A: We got them at SuperMaxi. >> A: Yep. There’s nothing. we’ll have a delicious snack. We have some avocado, too. Alright! So let’s get started. >> JP: And we have a salad. >> O: My stomach is talking to me. >> A: We have to have salad. Alright, so I’m gonna.. Whoops..
>> JP: That’s why we cut that over the sink. >> A: Yeah, well.. What can I say? >> JP: I love my new Fitbit! >> JP: And then we’re done. >> JP: This is a whole package of chips. A whole package of one of these. You can put salt on them. lime juice or spritz it with lime. my salsa is so good you don’t need that. >> O: Do you like it a little bit spicy? spice.. paprika or something like that. >> JP: That sounds good. which has a really cheesy consistency. It’s very tricky. It’s tricky/sneaky. >> JP: Well, it’s kind of like ricotta. But there’s a Mexican cheese..
>> A: I think you’re right. >> O: Look it up. south of Mexico that is called..
>> A: Sounds good to me. how to pronounce it properly. I didn’t explain that very well. Just basically like we were doing the..
>> A: She’s gonna re..
>> O: I’m done here? >> A: Yes. Nicely done. Ok. So I have one cup of salsa. in the juice of one lime. >> JP: The juice of one lime. >> A: The juice of one lime. the juice of a half a lime. >> O: So it needs another half..
>> O: ..juice of another half a lime. screaming if you listen closely. And I am going to use salt. So I’m gonna do a teaspoon of salt. >> A: So this looks great! And then what we’re gonna do..
You think I’d have this memorized by now. >> A: That can be found on LottaVeg.com. which is what we used to do. But this is so much faster. >> A: I don’t know if it’s really faster. >> JP: It is too! Look at that! >> A: Ok. Thank you. put in the oven and bake into chips. >> A: Alright. That sounds good. >> JP: These are so delicious. >> A: Oh, I know they’re so good! So they’re really easy to make. or black beans would be good too. I cooked them in our pressure cooker. you get oil free and LARD free. >> JP: You have to look at the labels. juices that they cook in. And then I added some veggie broth. a half a cup of chopped onion. And I did about two tablespoons garlic. And then I put in some salt, about..
on how salty you want it. And then, you just let it cook. and it gets nice and thick. And then you mash it with a..
>> A: This nice little tool. So one of these little limes. cool enough that we could work with it. if we want some on the side. >> JP: I love to have extra. So I’ve got 3/4 cup salsa to go on the bottom. I’m just gonna spread this out. from sticking.. to the bottom. No oil in this recipe. >> JP: Isn’t that the type of noodle? >> A: No, because, I mean.. people..
>> JP: Spaghetti is a type of noodle. Fusilli is a type of noodle. >> JP: Wouldn’t it be called a parfait? >> A: I have no idea! >> JP: Everybody love a parfait! >> A: OK! Moving on! 1/2 cup at a time. This can be a little tricky to spread. So this would be tricky if you did..
them come to room temperature. >> JP: Olesya’s taking over. >> O: Ready. Set. Go. >> O: Does it have to be perfect? you can use flour tortillas. Maybe you want more tofu..
or maybe you want less tofu. >> JP: That was my ONE requirement! steady rotation here in this house. >> A: A mainstay, yes. >> JP: Along with the juice of one lime? I don’t know why you find that so funny! >> A: I know. This is a very hardy lunch. the need to take a nap afterwards. >> O: You think so? >> JP: No gut bomb. >> O: I just like taking a nap. to take a nap afterwards. >> O: Do you like it? >> A: We do wanna finish up the tofu. >> JP: Yeah, so there’s only two layers. I had that mixed up. >> O: There is not so much left, though. Now we do our final tortilla layer. anything on top of this? And then one final thing of salsa. And then we just need to smooth that out. more salsa on top as well. >> O: Let me know when it’s perfect. >> A: That is perfect. >> O: When you think it’s good. >> A: I think that looks amazing. to pop it in the oven. >> A: We don’t.. we try to use as little..
>> O: How do you say in Spanish actually. >> JP: How is it? put it in the oven for..
>> A: 30 minutes. Yes. How do you say it in Russian? >> JP: That’s so cool! >> A: That is cool! >> A: I’m lucky I can make..
>> JP: Yeah. Extremely lucky! >> O: Sometimes you forget? >> JP: Alright, what are we doing now? >> O: Ok, let’s wait. >> A: We gotta wait. >> JP: Do we wanna make..
Olesya brought.. what did you bring? >> A: I would love to make that! >> JP: Do you want to make that? around 30 minutes to boil them. >> JP: Awesome. Now what’s it called? plátano maduro, the yellow one..
this one that I brought. It has to look a little bit..
and then we mix it with peanut butter. Mash it very well and it’s good! >> JP: It is delicious. Wow! Look at how she’s peeling! >> O: I’m just peeling this. >> A: Yeah. That’s not how I did mine. >> JP: Yeah. We did ours..
>> O: How did you do it? and then we cut it..
>> O: That doesn’t work. >> JP: ..then we ended up peeling it off. >> A: You’re right. It does not work. >> JP: It doesn’t work..
Let’s add some water guys. and let it boil for about 20, 30 minutes. it’s gonna take too long. see how it’s coming along. and letting it cook uncovered. >> JP: Wow. It does. And we’ll finish the cooking. >> JP: And how are the maduros coming? >> A: Do we need a fork? >> O: They still need. >> JP: Quite a bit. That was really hard. >> O: They gonna take awhile. >> A: So the maduros are duro? >> JP: No, those are verdes. >> A: Maduros are the yellow..
>> JP: The yellow ones. >> A: Alright. I think we’re ready. Oh. See, it’s all bubbly. >> A: Smells really good. >> O: It’s that time. >> A: It is that time. >> JP: How is our plántanos coming? time because they need to be soft. I don’t think they’re ready yet. >> A: Do we wanna get our salad ready? >> A: And I warmed up those refried beans. >> JP: That looks DElicious. >> A: It does look delicious. >> O: I think we..
in case you don’t like it. >> JP: What’s everybody think? >> A: Wow it smells really good. >> O: Peanut always smells good. peanut butter to put in there? >> O: I don’t actually. It depends..
>> JP: You have to taste it. So it doesn’t have all this chunks. >> A: Yeah, wouldn’t that be nice. people can be really envious. >> JP: Alright, what are we adding? >> O: I added some cranberries. So it’s a little bit sweeter. And let’s put a little bit more. >> A: It looks delish. >> O: I like cranberries. >> A: What a neat idea for dessert. >> O: Which is the yellow one. >> O: It’s very good. some date syrup over it. >> JP: Wow! That looks really good! >> O: [laughing] Hope it tastes good also. >> A: I’m going in. >> O: Let’s do it! >> A: That’s really good.. yeah. It’s just the right amount of sweet. >> JP: It sounds just like me! You’re just full of it today. second episode of Food With Friends. >> A: Oh, there’s an unhappy dog. >> O: We had a delicious lasagna today. >> A: We’ll move on to our next..
>> O: Yeah, that would be great. >> O: Thank you so much guys! >> O: I love being here! >> A: Aww. Well we love having you. Thank you. We’ll see you guys soon. Oh don’t forget to subscribe! In this episode of Food With Friends, our friend Rachel joined us for some delicious Lazy Girl Easy Vegan Enchiladas and weird exotic fruit tasting. 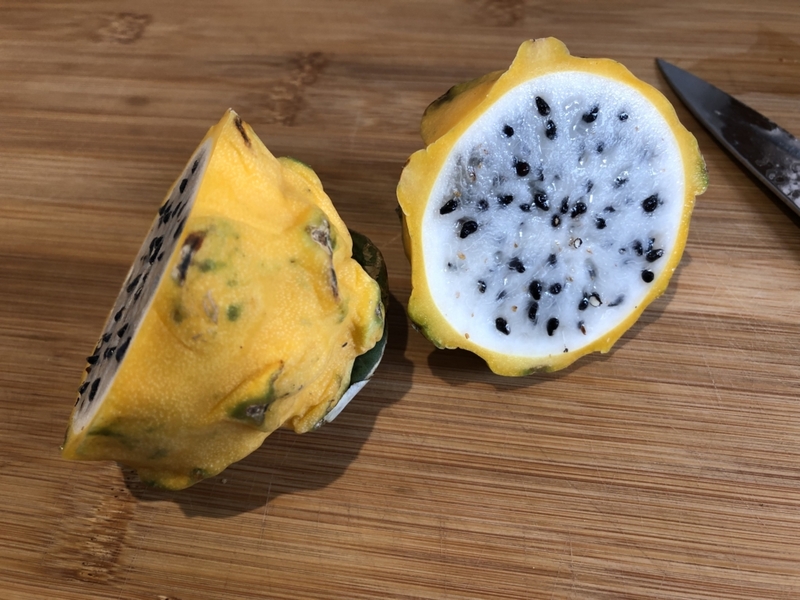 The fruits we tasted were Dragon Fruit (pitahaya in Spanish), Ecuadorian Guava and Sapote. The Dragon Fruit is extremely sweet and juicy. 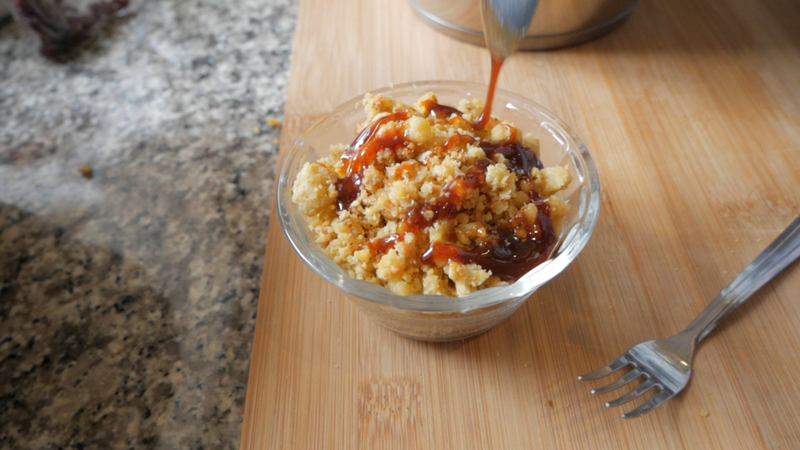 Just cut it in half and dip out the goodness with a spoon. We love Dragon Fruit, but it is a very effective laxative so it’s best to eat in extreme moderation. That little bit I ate in the video completely cleaned me out the next morning! The Guava is a lot different than us North American’s are used to. 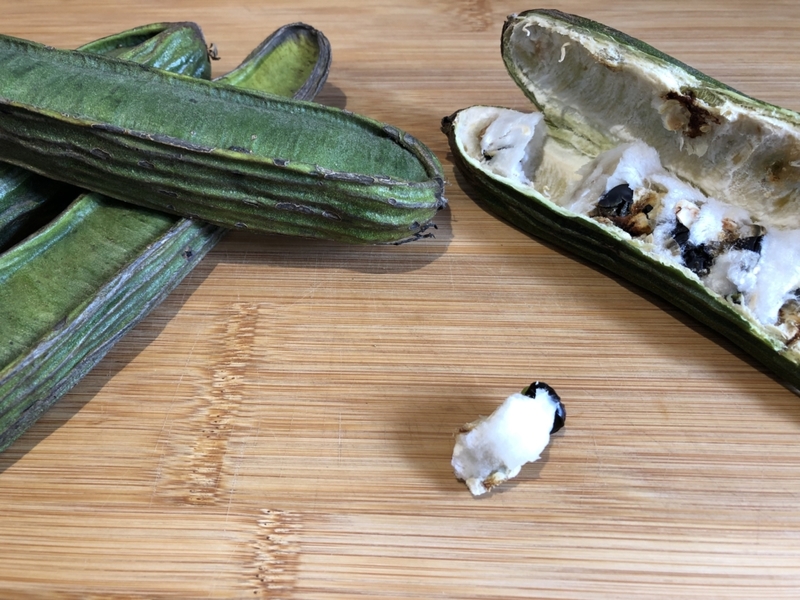 Here in Ecuador, it’s a pod with a white, edible cotton-like pulp and lots of slimy black seeds. The pulp is sweet with the consistency of cotton candy. None of us were huge fans of this fruit. It was mostly seeds and the edible pulp clings to them so you have to put the whole thing in your mouth and spit out the slimy seed. The Sapote was quite delicious, but a bit stringy with lots of large seeds. It was hard to cut and the strings got lodged in our teeth requiring floss to remove them. 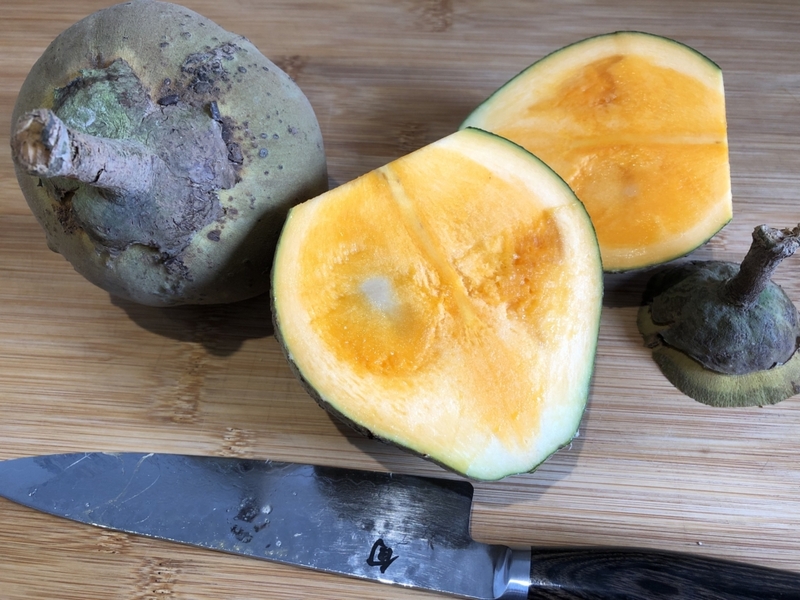 It tasted like a cross between a cantaloupe and a sweet pumpkin, but the the consistency of a stringy mango. While it was a bit more high maintenance to eat than a mango, it was delicious and we all agreed, worth buying again. 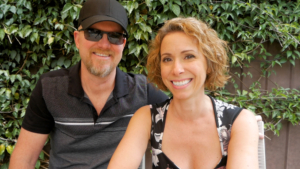 This is our first “Food With Friends” episode on Amelia And JP. We have several friends in Cuenca who have asked us to help them cook more plant-based meals so we thought we’d share the experiences with everyone. In this episode, Olesya joined us to make our Tofu Scramble recipe, and we also improvised a sweet potato recipe to go with it. The Tofu Scramble recipe can be found on our sister recipe and meal plan website, LottaVeg.com. We haven’t published the new sweet potato dish yet but we do have another Sweet Potato Hash recipe that’s delicious. 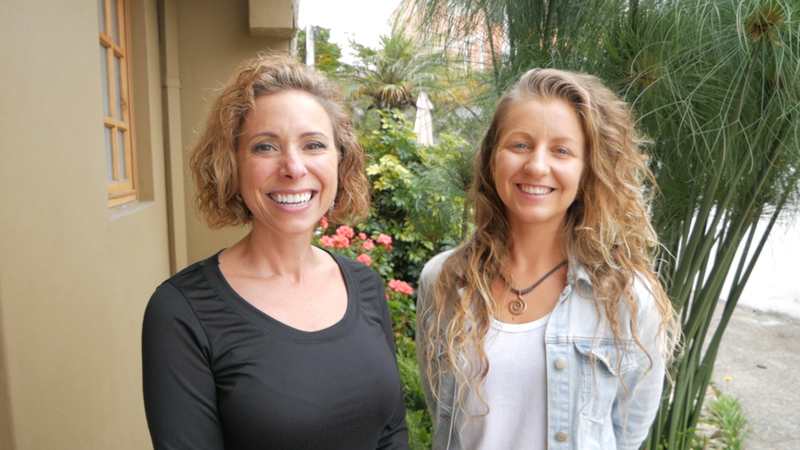 Olesya is transitioning to a full vegan diet and already eats mostly plant-based. Over coffee one morning, she mentioned that she hated tofu, mainly because she didn’t know how to prepare it. So we invited her over to share our delicious Tofu Scramble recipe, which she loved! Now, she wants to come back for our Easy Vegan Lasagna made with Tofu Ricotta so look for a future video with Olesya.